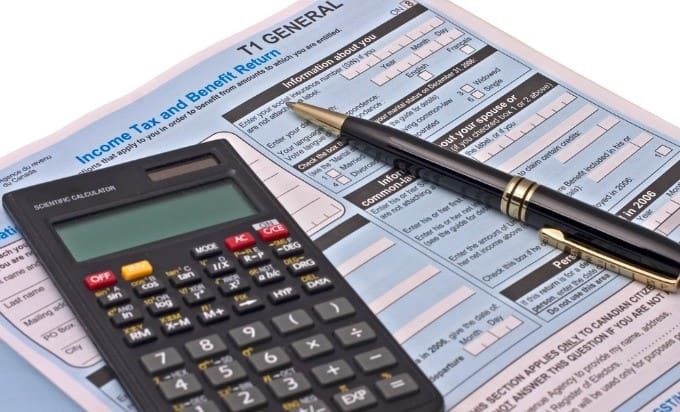 The deadline to file taxes is on May 2nd this year and it’s creeping up fast. Are you ready? Shockingly, I’m organized this year and getting set to file ours in the next week. As someone who typically waits to the very last day to file, this is a big step for me. I always breathe a big sigh when it’s done and this year, I decided why wait? Just do it. For the past 10 years, I’ve been paper filing our taxes. What I mean by this is that I prepared them by hand and painstakingly filled out each and every form. It was a tedious process that took forever to do. Even a simple return like my fiance’s took a couple hours from start to finish. You can see why I procrastinated doing it. I had other things I’d rather do then slaving away over tax forms and double and triple checking my math. Let me give you a little background to help you understand why I like to do my own taxes. I worked in a public practice accounting office from 2002 to 2007 as an accounting technician working towards my CGA (Certified General Accountant) designation. Part of my job was preparing corporate and personal income taxes for our clients. I’m no longer working in that field, but my experience has helped me in my current career, running my own business – this blog! I figured I’d just do our taxes myself because it was something I had done for years. The only thing was that I didn’t have the software to do it. So paper file it was. I also wasn’t crazy about mailing in all those forms to CRA. I usually register the envelope to ensure it gets there. Lost mail happens and it would not be cool to lose our returns in the mail. Typically over 11 million Canadians file online and I felt I should be doing that too in this digital age. I wouldn’t have to worry about lost mail or paying extra money for postage. Also, this year I’ve got an extra tax return added to my plate. My 17-year-old daughter, Olivia, had a part-time job in 2015 and I need to prepare her tax return too. She knows she’s getting a refund so she’s been asking me since she received her T4 if I’ve done them yet. I better get cracking! Surprisingly, I’m looking forward to doing our taxes this year. I’ve got a little help! I’m going to be using H&R Block’s Online Tax Software to prepare John and Olivia’s tax returns. And guess what else? It’s 100% FREE. I know, I did a double take too! Don’t worry, there are no hidden fees. 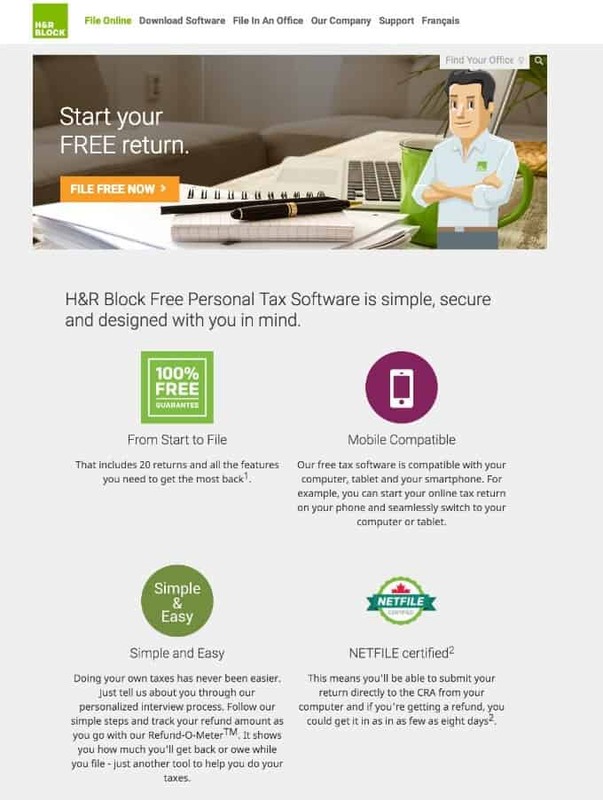 H&R Block recently unveiled its free Download and Online Tax Software for Canadians for those of you who, like me, prefer to DIY. 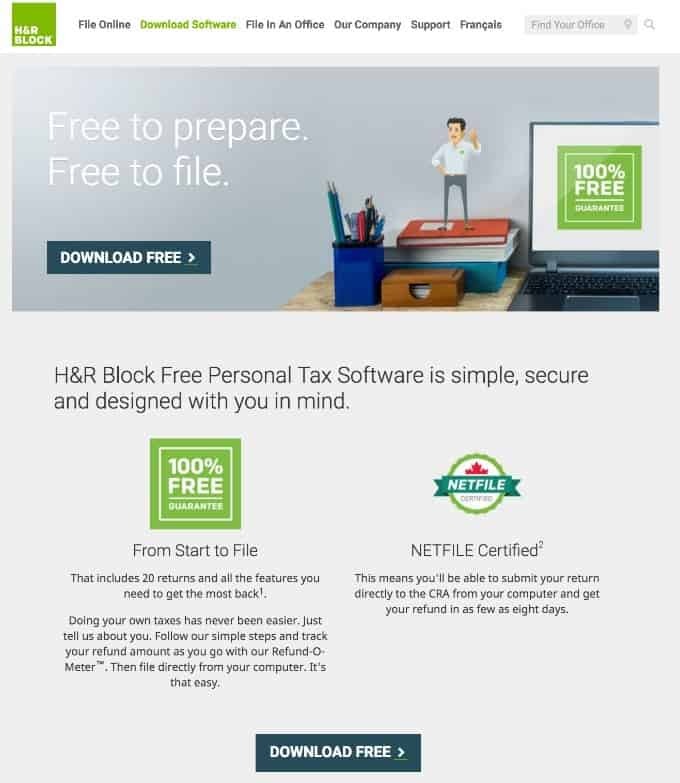 You can download the tax software to your computer from their website. You don’t have to go to the store, buy a program and then install a CD. Or you can just do it online right on their website like I plan to do. H&R Block Canada is a trusted brand with more than 50 years of Canadian tax return experience. With over 1,200 offices across Canada, chances are you have one near where you live too. You might find this interesting. When I was working in Edmonton for the CGA office, my boss enrolled me in the H&R Block Personal Income Tax course. He said that they offer a “top notch” course and it would help me with my duties in my current job! I learned a ton from the course and have been a fan of H&R Block since. They know taxes – simple and complex! I’ll be sharing another post in the first week of April telling you about my experience filing online with H&R Block’s Online Tax Software. I’m looking forward to getting them completed and I can cross off a big item on my to-do list. I encourage you to try H&R Block Download and Online Tax Software if you are the DIY type like me. Visit hrblock.ca and either download the software or select the online option to get started. You’ll be instructed through the step-by-step process of preparing your returns. If you have questions as you go along, reach out to H&R Block’s 24/7 technical support and tax advice. They offer a help centre, live chat and a toll free number. If doing your own taxes isn’t for you, that’s perfectly ok too. Visit an H&R Block location near you and have one of their experienced tax professionals prepare it for you. What are your plans this year for doing your taxes? Connect with H&R Block Canada on Facebook and Twitter. My hubby is an accountant, so he does our taxes. Actually, I need to remind him to get started because I need that refund to pay off our Disney trip. I know there”s always talk in the government about abolishing this system. It couldn’t come soon enough for me. I think the IRS is one of the biggest crooks out there, and if you ever have to repeal their decisions, you’re in for a long run. My husband owns a small business and I’m a SAHM (college educated and a former social worker, but loving being home with the kids). So, I don’t have to worry about taxes. He has an accountant who does that for us. I just have to gather documents that come in the mail for him to take to the accountant, I keep them in a folder for him. i usually e-file online with TurboTax, but this year we had differences than the past years so I had to fill everything out online and then print and send in. I am hoping we’ll be able to e-file next year. I forgot to sign the papers since I electronically signed and they got sent back and I have never had that happen before. It’s because when you sign online it doesn’t show up once printed and I didn’t know that. I go to a tax account as it’s way to difficult to do them myself. I always did them myself up to coming here but now it’s just time consuming collecting all the paper work. I am very happy to say we are done for this year for taxes. Unfortunately we did not get any kind of refund, but we have the money we needed to pay into it. I’ve been e-filing our taxes for the last 10 years. so easy to do! I love electronic tax filing. So convenient and easy ! I do our taxes and I do have the same fears that I’m missing out on deductions or programs that I’m unaware of. It sounds like H & R Block has a great product for people like me. Thank goodness our taxes are out of the way thanks to my husband but I’ll have to check out H & R Block for next year! I might have to check this out! I need HELP with my taxes, and I’m always terrified of messing up! Thanks so much – I think I’ll use this service, especially since it’s free! I always like to plan ahead during tax season. I often times use our refund towards paying ahead on bills, paying for a vacation, or as a down payment on a car! Oh you got me excited with that May date – and then I remembered you were in Canada. However, these tips are good reminders of my shorter deadline and I always use HR Block. This is such a great resource, you gotta love free! Taxes stress me out! I use H&R Block every year! It is so easy and simple to use and I love the free version! Convenient! I am very lucky to have a family member that is an accountant. He does all my taxes and financial work. I would be to worried to make a mistake if i did them myself. We are doing our own taxes for the first time this year. I am getting all my papers together so i can do them this weekend. I can’t believe you did them by hand for years and years. I’m impressed! I have to take mine to get done. I like e-filing with Turbo Tax. I hate tax season, I myself usually wait to the last minute. This year I have filled my taxes even though their not due till April 15, 2016. It was great to hear about H&R Block has free e-file. I have never filled with them before but it definitely looks simple enough.